From 16 to 18 May 2018, our CEO Kathrin Wieland, together with German Key Account Managers Florian Lipp and Malte Hoepfner, were off to Nuremberg to attend the Deutscher StiftungsTag 2018. This yearly convention, which drew 2,000 representatives from foundations all across Germany, saw them attending workshops and panels, as well as connecting with the sector over three fast-paced, yet fulfilling days. As a new member of the Bundesverband Deutscher Stiftungen (Association of German Foundations), it was our first time there. We couldn’t wait to catch up with them once they got back to our office in Berlin and hear all about it. Welcome back! There’s a first for everything, such as TolaData’s first appearance at the Deutscher StiftungsTag. How do you feel about the experience? Malte: We had a great time and it was useful for us to be there because we could talk to other participants, present TolaData to them, and gather their feedback about our product. Most people whom we spoke to were enthusiastic with regards to what we have to offer, but there were others who were rather cautious about both digitisation and monitoring & evaluation (M&E) in general. To see that and to have their point of view explained to us, however, was incredibly valuable. So let’s get into some of the more interesting bits about the conference. Was there a particular panel or workshop that left a deep impression on you? Florian: Yes! Christoph Deeg’s session on gamification in Africa stood out for me. In Addis Ababa, Ethiopia, he’d created a gaming app together with local developers, artists, architects and actors of civil society — one in which its residents from all walks of life could connect with each other through the app and exchange their views to build a unifying vision for the city. I liked this participative approach as it was more about enabling the people instead of a top-down, directive way of stimulating change. What would you say are the benefits of a participatory approach over a top-down approach? Florian: This came up in a lot of panels: If you would like to introduce a new IT infrastructure in your organisation, you need to work closely with your employees and empower them to be a part in bringing about positive change. Getting them involved shows that you respect them, and if you don’t, they might feel threatened or even resistant to what you’re trying to accomplish. 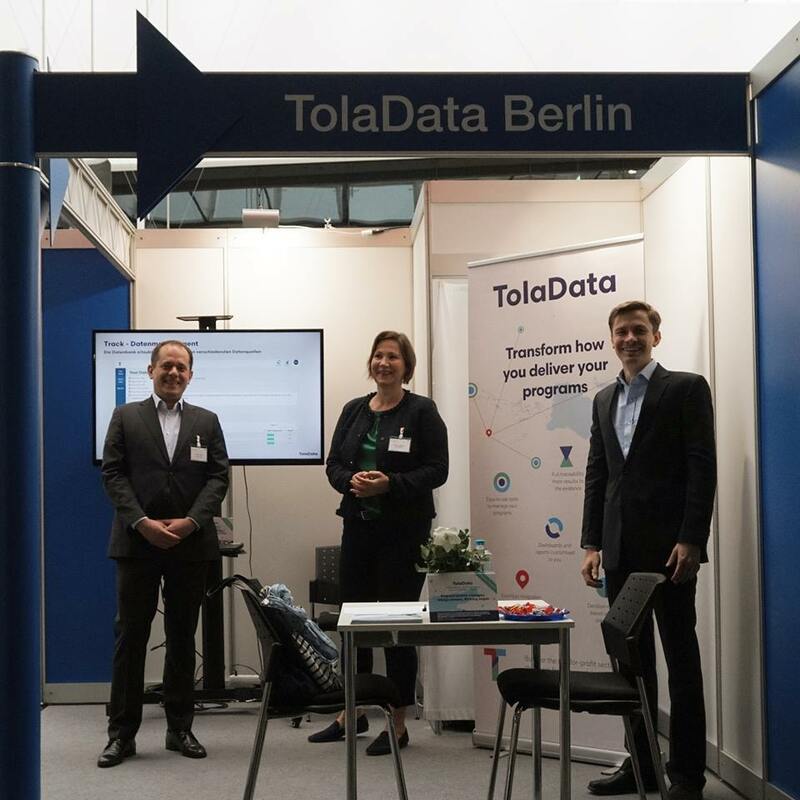 TolaData’s booth at StiftungsTag 2018 with our CEO Kathrin Wieland (middle) and Key Account Managers Florian Lipp (left) and Malte Höpfner (right). That’s a meaningful takeaway. With digitisation being the overarching theme at this year’s Deutscher StiftungsTag, what were the discussions on it like? Malte: A common debate indeed; there seems to be different understandings of what digitisation means. Some think digitisation means introducing new tools, while keeping an organisation’s values and processes exactly the same. Others fear digitisation because they think it’s going to transform the organisation inside-out, to the point where they lose sight of their vision and mission. Then there are those who take a balanced view and believe that digitisation is more than just technology — it induces organisational change in terms of culture, ways of working, and strategy. Were there positive examples of foundations that had embraced digitisation? Malte: At one of the workshops I attended, ‘Digitisation in Nonprofits & Foundations: Status Quo, Perspectives & New Ways for More Impact’, Markus Seidel from the Off Road Kids Foundation spoke about the opportunities digitisation offers non-profits. His organisation provides assistance to homeless youths, most of whom learnt about the organisation on the Internet via very literal search terms like, “I’ve messed up my life and don’t know what to do next”. By working with an agency that specialises in Google Adwords, his foundation could optimise their clickthrough rate and significantly increase the number of young adolescents reached. By including their contact details for the youths, their online activities allowed them to create an “offline” face-to-face connection with one of their social workers. It was a beautiful example of how “online” and “offline” go hand-in-hand. Malte: Yes. And it shows that as a non-profit representative, while one does not need to understand all the details of a certain technology, one can acknowledge the potential of it, embrace it and team up with technology-savvy companies to make great things happen in terms of impact. That was very inspiring to see. Mr. Seidel also explained how he didn’t follow any trend just because it had “digital” in its name. Rather, whenever a digital tool was introduced to him, he would take a critical look to see if it actually made sense for his organisation before adopting it. I think that’s very sensible. 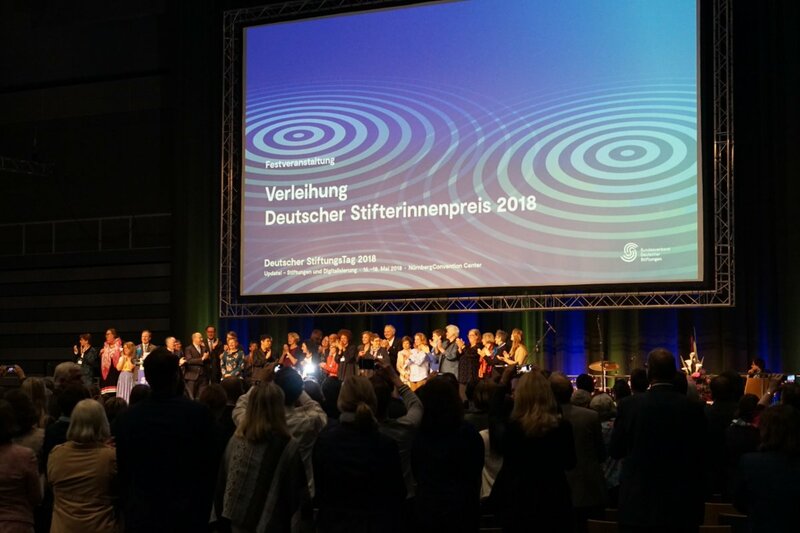 A standing ovation for Ise Bosch, Deutscher Stifterinnenpreis 2018, and her fellows. Ise Bosch, a founder and activist for the LGBTIQ community, is this year’s recipient of the prestigious Deutscher Stifterinnenpreis (Founders’ Award). Could you tell us more about her? Malte: As an heiress of the Bosch family (her grandfather was Robert Bosch, founder of the multinational industrial conglomerate), Ise Bosch has always been very open and reflective of the privileges she has enjoyed in terms of her personal wealth. In her speech, she made it clear that her wealth is an inheritance — something she had not worked for, but rather, a gift bestowed upon her which she felt she had to use responsibly, by spending it wisely on the causes that mattered to her and working closely on them with people around the world. Impressive! What was significant about her win? Malte: It was the first time that a woman was the sole recipient of the award, yet she didn’t take credit for it all or made the ceremony all about herself! Rather, she saw herself as part of a larger team of activists and honoured them by inviting them onto the stage with her. This modesty combined with a strong team spirit was very inspiring to witness. Felix Oldenburg, General Secretary of the Association of German Foundations, said later in his speech that this will be a moment in future when we will look back and say that change was set in motion. He was touched by her words, just like us and many others. We gave her a standing ovation.